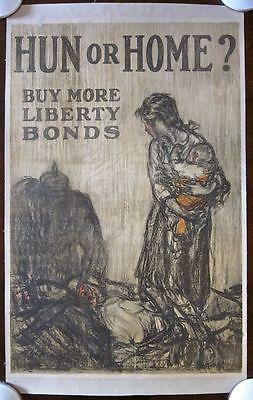 REDUCED 120$ TO-DAY BUY THAT LIBERTY BOND 1918 WWI POSTER – SUNRISE ARTWORK! TO-DAY BUY THAT LIBERTY BOND – ORIGINAL 1918 WWI POSTER – GREAT SUNRISE ARTWORK!Original 1918 WWI Advertising poster (22″ x 28″) Poster has surface creases, border wear with wrinkling & tears, small border chips and some wrinkling throughout. This poster is overall in Good Condition. Please refer to the accompanying image for a detailed view of this original advertising poster. We are adding new WWI and WWII, advertising and travel posters daily so please check back for new items! CUT $100!! 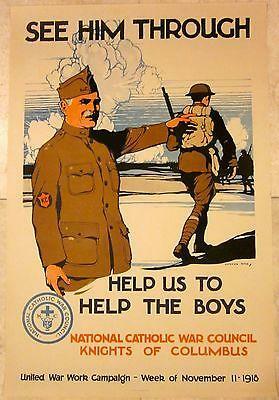 ORIGINAL 1918 WWI POSTER - SEE HIM THROUGH, HELP US TO HELP THE BOYS! CUT $100!! ORIGINAL 1918 WWI POSTER – SEE HIM THROUGH, HELP US TO HELP THE BOYS! CUT $80! 1918 WWI US FOOD ADMINISTRATION POSTER - OUR FLAGS BEAT GERMANY - LOOK! CUT $80! 1918 WWI US FOOD ADMINISTRATION POSTER – OUR FLAGS BEAT GERMANY – LOOK! BROTHER YOU'VE GOT SOME COMPETITION - ORIGINAL WWII POSTER - RONAN LABOR ART!! BROTHER YOU’VE GOT SOME COMPETITION – ORIGINAL WWII POSTER – RONAN LABOR ART! !